This has most assuredly not been a Skylar pregnancy. Thank. The. Dear. Lord. It's still a "girl" pregnancy though. Why they have to make me feel so bad and make me so ugly, I'll never know. Hello acne. We met briefly in high school. I didn't like you then, I don't like you now. Grrrrr. I had my first prenatal appointment yesterday. I'm seeing a midwife this time and am so excited about the birth. Unless the baby is in there sideways and can't be turned, I'm having her at home. Not having an ob to turn to isn't going to allow me to give up and have an induction at the end. I'm feel like she's going to have brown hair and brown eyes and weigh eightish pounds. I was spot on with Skylar, so we'll see if I'm in tune this time too. Sterling, my only brown/brown child has his fingers crossed she does too. And for the record, we all want her to actually be a her. We're at a loss for names. Brandon is adamant that if by some miracle she comes out a boy, his name should be Samuel. I'm so not a fan and have no intentions of using that name. I think it's important for a parent to actuallylike the name they name their child. I don't hate it, but I just don't feel the love for it either. The middle names are Ann and Jean. Who knows what we'll end up with. Maybe none of the above. I will say this is the first time we don't have a name picked by now. I honestly won't be surprised if she's still nameless when she's born. Good thing it won't be in the hospital and no one will be pressuring us to get the birth cert filled out ASAP. Tell me what you think of the names and by all means, offer some suggestions!! Well. The last thing I thought I'd be doing was updating THIS blog. 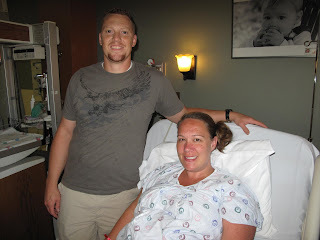 I've been kicking myself for not keeping up our family blog and had NO DREAMS I'd need to update my PREGNANCY blog. 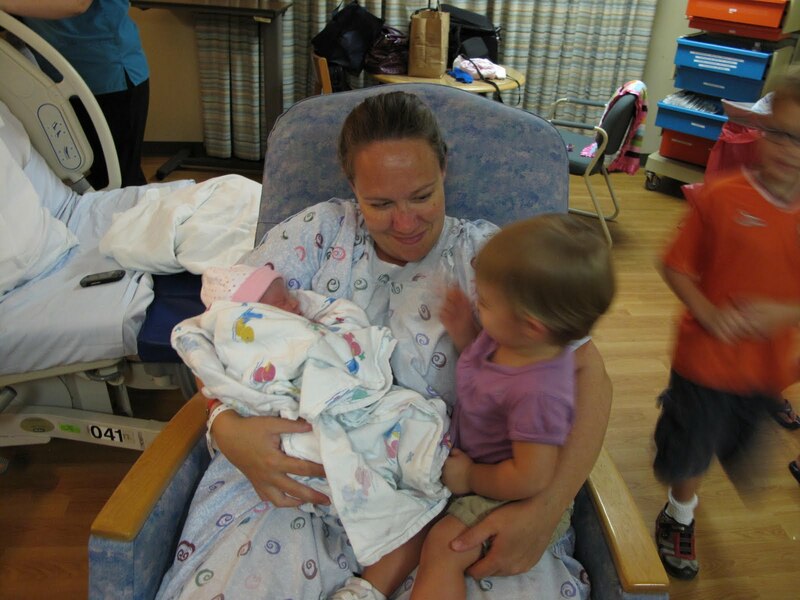 Just over a year ago I was giving birth to our seventh child. It was the ending of the most tumultuous time of my life. Brandon separated from the Marine Corps. We didn't know where to live. I was having an out of body experience resulting in my becoming the most horrific person on the face of the planet. I swore I'd never get pregnant again. And I was serious. But here I am. Number eight is 15 or 16 days old today. Growing and nestling into my uterus. How do I feel? Honestly? I'm excited. I honestly didn't want to ever go through this again, but I can't imagine this part of my life ending already. I have a strong feeling that this pregnancy will be nothing like Skylar's. This child will be a blessing to us and to our family. There are going to be a lot of naysayers. I'm related to most of them. How does that make me feel? Honestly? Like cutting them out of my life. What good is being negative and hurtful going to do now? This baby wasn't asked for, and certainly wasn't prayed for, but is growing, nonetheless I will never refer to her/him (from here on out referred to as her) as an accident or an opps. Though we didn't ask for her to come here, we want her and love her already. I'm blessed to be able to grow her under my heart and love her with it, just the same. We've chosen to keep this a secret as long as we can. Why? I don't want to hear the negative things from those that are supposed to love us most. And we will. I can hear them now. This will, no doubt, be an overwhelming time for me. All pregnancies are. I don't need to defend it. I don't need that to dampen my spirits now. What do I need? I need your prayers. I need your love and support. Whether you agree with our situation or not, love and support are vital for survival. I have no idea when I'll make the blog public again aka: announce our new addition, but I hope my readers will understand why I chose to make it private for a time. I need to be able to journal this journey. It's important to me. 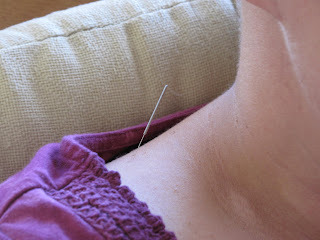 So, in my attempt to get this baby out, I enlisted the help of a doctor in the area that specializes in acupuncture. He came over Monday, the 4th. If it's going to work, it will typically work within 24-48 hours. At the 24 hour mark, nothing had started. Brandon was scheduled to start his new job on the 12th and would be unable to request any time off once he started. Here is was the fifth and no signs of baby coming. I was starting to get panic-y and called the doctor to talk about induction. He told me to come in and if I was dilated enough, then he would be able to justify an induction to the hospital. I guess you have to be 39 weeks to schedule an elective induction. 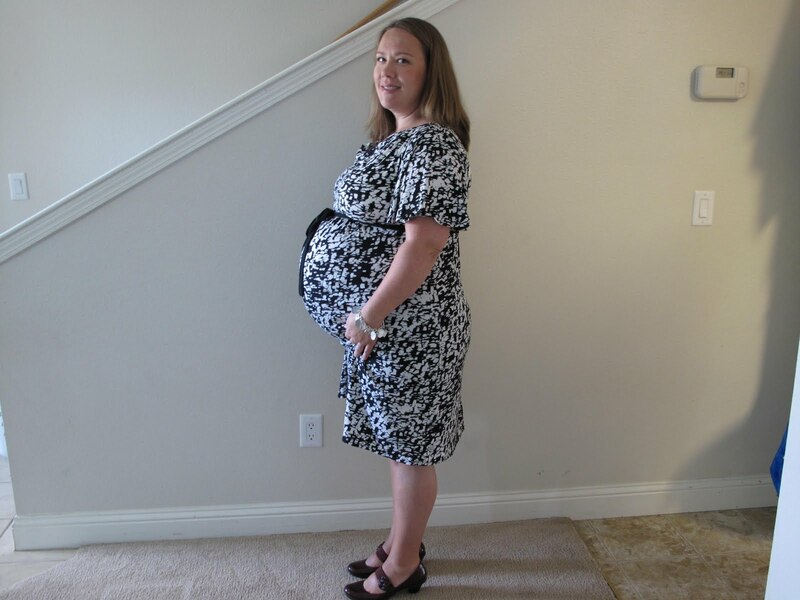 I was two days shy of 39 weeks. When I got off the phone with him I called Brandon, who had just been on the phone with his new boss, and was informed that not only would he indeed start on the 12th, but he would be going out of town for two weeks. On the 12th. INDUCTION IT IS!!! How could we leave it up to chance knowing he'd be out of town??? Not happening. So I go in at 2pm. He checks me and tells me I'm a five with a bulging bag. Hello! That means I'm in labor!! The acupuncture worked. And this explains why I was feeling panic-y. At this point, I should have just gone home. But no. I was determined this was it. I headed over to the hospital and Brandon took the kids to the sitter and came to the hospital. The doc got there about 4:30 and checked me again. I was now a seven. 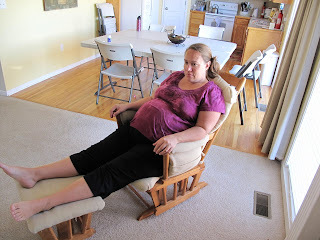 Still no contractions mind you. He then broke my water. And we sat there. And sat there. 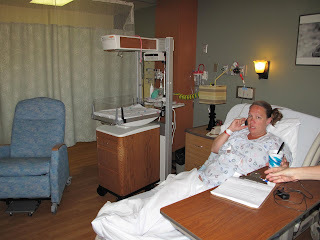 I had tiny little contractions for a bit and then a hard one. And then two more hard ones and it was time to push. We almost made it without the help of the lovely hospital staff, but low and behold, they just HAD to come in and see how I was doing. When the nurse realized I was pushing, she came over to the bed and started getting it ready. She dropped the end of the bed right out from under my legs. I was now sitting on the end of the bed as if it were a chair. 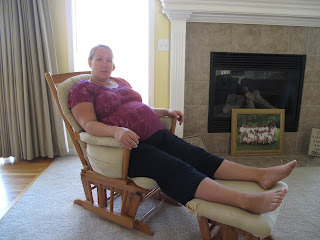 Can I tell you that it is NOT conducive to comfort and does NOT aid in the pushing out of a baby AT ALL?? OH. MY. GOSH. It hurt so bad having my legs down. I could have slapped her. All I could do was say, THIS HURTS. Brandon came over and grabbed my leg so I was able to have something to push against. Thank you dear! I'm once again pushing(third push) and the doctor isn't ready. This is the same doctor who missed Sadie's birth my minutes. He was sleeping in the room next to my room and didn't hear the nurse call him I guess. So, he turns around and grabs a chux pad and delivers Skylar with no gloves on and his face mask sideways. Guess he's never going to judge just how fast I deliver these babies. 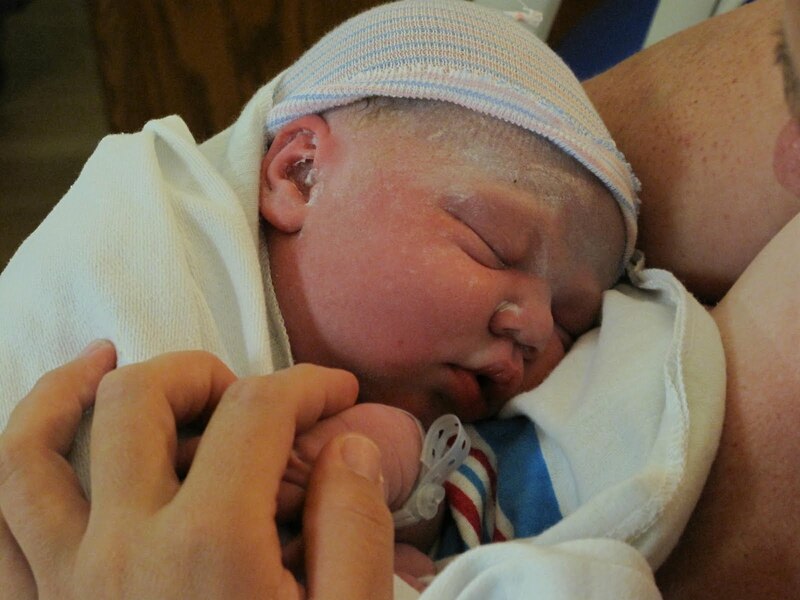 She was born at 5:35pm. The doctor agreed to not clamp her cord, but when I tried to pick her up, he refused to to let me. He said she would bleed back into me. What a joke. So I sat there arguing with him and trying to pick her up so he grabbed her cord and pinched it shut. I just looked at him and said, "If you're going to pinch it, you might as well clamp it." She did get a good five minutes or so of it pulsating without interruption, so that's good. I guess. Better than nothing I suppose. The nurses in the mother baby ward were awful and made the experience a nightmare. I SHOULD HAVE JUST GONE HOME. But it's over and she's here and she is amazing. She has an extra toe. It will have to be surgically removed some time during her first year. It's interesting that she would end up with an extra toe. For some reason, I was worried about her feet during the pregnancy. I was more worried about a clubbed foot or something else, but an extra toe....never thought of that. WOW. So close. But yet....so far. I'm getting so anxious to meet this little girl growing inside me. I'm so not a patient person and the suspense gets worse every time for me. I suppose it's because each and every time we bring another soul into our family, we realize just how special and blessed we are to be able to do so. Today is exactly how far I was into my pregnancy when Seth was born. He was five weeks early and totally fine. A bit on the small side, but no worse for wear. Though he sports one heck of an attitude....not sure if that's a direct result or not. I think I'm willing to carry her a few more weeks if it means less drama and insanity from her. That having been said, I'm sure it's Seth's birth order that's caused the personality traits and not being preterm. LOL!! I mean come on. 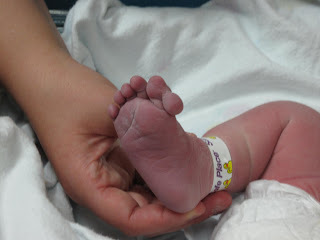 The youngest of five boys, AND small? AND having the first girl born AFTER him? He hasn't got a shot in the dark of not having at least a touch of attitude. Poor guy. And said girl already bosses him around. Not to mention the fact that she hits and bites him as well. I keep telling him to stay out of her face, but he doesn't listen. He's a bit of a slow learner. So 35 weeks. I'm in the home stretch. It's been awful, and it's not over yet, but I see light at the end of the tunnel! WOOHOO!! How could you guys let me go SIX WEEKS without an update???? And here I thought you CARED. Just kidding. 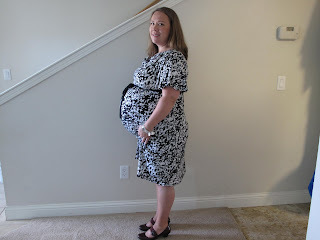 I'm now 32 weeks along in the crazy pregnancy journey. And as I've stated time and time again, I could not be more miserable. Physically anyway. That having been said, I am still so grateful for this little girl growing inside me. The jury is still out on whether or not she IS actually little though. I sure feel like I've got a mammoth of a baby growing inside me. I have never had breathing problems AND peeing problems, but boy do I ever. I've never peed so much in all of my life. I'm pretty sure she's head down, but I'd also swear she's using my bladder as a trampoline. I think about her all the time and wonder what she's going to look like. I've got it in my head that she's going to have red hair. I had a dream last night that I gave birth last night. And despite being 32 weeks, she weighed 7.9lbs and was just fine. She did have dark hair in the dream though. My 35 weeker weighed in at 6lbs and I thought that was big for a preemie. Can you imagine 7.9 at 32 weeks? That would mean one big ol' baby at 40 weeks. Not that I've ever been a day past 39 weeks. Oh shoot me now if I even come close to 39 weeks. That having been said, I've have some sort of augmentation/induction with four of the six. The only two left alone came early, but I don't know if I'll always go early. Having a unassisted homebirth means I won't have anyone willing to do any augmentation. Notice I said WILLING. Brandon COULD strip my membranes, but refuses. Probably a good thing. Inductions aren't in the best interest of the baby. Best interest of my comfort, but we won't go there. Please pray for my sanity as I struggle to the end here. It's getting difficult and I know I need to stay strong, both mentally and physically. It's so important for her health. I have no complaints!!! 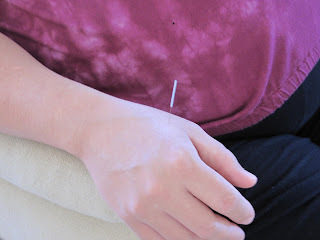 In fact, I was resting yesterday afternoon and was thinking to myself how good I felt at that moment and for half a second thought, "WOW, this is the best pregnancy ever". Then I shook my head and rolled my eyes at my pregnancy induced stupidity. LOL!!! Amazing how quickly we forget our misery. For good reason that is. Most of us would have ONE child if we were able to recall every second of misery during pregnancy and childbirth. During every first trimester, I make Brandon promise me he'll never get me pregnant again. This time he got it on video. He thinks it will stop this from ever happening again. He. He. He. I won't lie. Most days I hope this never happens again, but then when I truly imagine this part of my life being over, it scares me. I'm not sure I'm ready to move on. Thanks to my iPad, I've been able to spend my sleepless nights watching and reading birth stories online. Can I tell you that it doesn't help make time go by faster? Just thought you'd like to know that.